Front-engined front-wheel drive racer will debut at Silverstone. Unveiled during last night’s Super Bowl XLIX, this is the Nissan GT-R LM Nismo – the cutting-edge LM P1 racing car that Nissan will look to secure victory with at this year’s Le Mans 24 Hours. Adopting a front-engine, front-wheel drive layout, power will come from a 3.0-liter twin-turbo V6 paired with KERS (kinetic energy recovery system), while drive will be channeled via a five-speed transmission and hydraulic limited slip differential. Built using carbon composite body panels, a polycarbonate windscreen and adjustable rear wing, the LM P1 racer weighs just 880 kg, and sits 4645 mm long, 1,900 mm wide, and 1,030 mm tall. 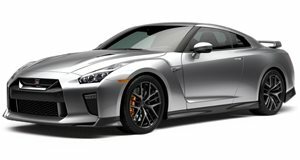 It sits on 16-inch BBS center-lock magnesium alloys and stopping power comes from Nismo-developed brake-by-wire active brake system and six/four-piston front/rear calipers. Other features include a Nismo steering wheel-mounted LCD screen, five-point harness and lightweight fire extinguisher. Before doing battle at the Circuit de la Sarthe, the Nissan GT-R LM Nismo will head to Silverstone for the FIA World Endurance Championship on April 12 and will also compete at Spa, the Nurburgring, and on circuits in the US, Japan, China and the Middle East.